Draft: 2000, Pittsburgh Pirates, 20th rd. Jose Antonio Bautista...Attended Chipola (FL) Community College... Attended De La Salle High School in Santo Domingo...Was featured as the cover athlete for the Canadian edition of MLB 12: The Show and MLB 13: The Show...Participated in the Toronto Blue Jays Winter Tour in 2013, 2015 & 2017...Is President and Founder of the Bautista Family Education Fund...Dedicated to raising awareness and providing assistance for young amateur athletes by providing access to higher education to help them succeed both on and off the field. Had his streak of reaching base safely in his first 14 career postseason games snapped Oct. 9 vs. TEX after going 0-for-5...At the time it was the fourth-longest streak among active players behind Lorenzo Cain (20), Daniel Murphy (18) and Alcides Escobar (15)…His 14-game on-base streak to start his postseason career was tied for the 11th longest in postseason history...Hit his 6th postseason HR (all with TOR) in GM 1 of the Division Series vs. TEX...That HR ties him with Joe Carter for the most HR hit in Toronto's postseason history...Is the 4th Blue Jay to record at least 7 seasons with 20+HR (Delgado-9, Carter-7, Wells-7) - 3rd player to do so in 7 consecutive seasons (Delgado 1996-2004 & Carter 1991-97)...On Sept. 24 vs. NYY hit his 20th HR, a 3R shot which broke a 0-0 tie in the 8th inn…Was his 16th career HR in which he has given his club the lead from the 8th inning on…Was his 14th HR as a Jay that has given the team the lead from the 8th inning on (2nd most in team history - George Bell has 16)...Hit a HR on Sept. 21 at SEA which tied game at 1-1 in the 9th inning…It was the 11th time in his career to either tie or put team ahead with a HR from the 9th inning on (all with TOR)...Hit his 4th leadoff HR of the season (8th career) on Aug. 31 at BAL, coming on the 1st pitch of the game...Marked the 8th time a player has hit a HR on the 1st pitch of the game in club history (last: Jose Reyes in 2014) & 2nd time Jose has done that in his career (last: Sept. 29, 2009)...Was placed on the 15-day DL for the 2nd time this season on Aug. 10 with a sprained left knee...Returned from DL on Aug. 25...On Aug. 2 at HOU, hit his 300th career home run (1R off McCullers in the 3rd inning)...At that time, he became the 10th active player with 300+ career HR...His first career HR occurred in his 133rd AB as only three other players in the 300 HR club failed to hit a HR in their first 130 major-league at bats: Ivan Rodriguez (196), Andre Dawson (159) & Rogers Hornsby (135)…courtesy of Elias...Also at that time became the 10th Dominican Republic-born player with 300 career HR...Returned from a rehab assignment at Buffalo (AAA) on July 25 & was activated from the 15-day DL (strained left big toe)…Appeared in 4G (3 with Buffalo & 1 with Dunedin) - combined to go 2-for-14 (HR)...Was placed on the 15-day disabled list with a strained left big toe...Banged the left big toe against the right field wall after going for a ball in the corner on June 16 at Philadelphia...On May 31 vs. NYY had a 17-game on base streak snapped (0-for-4)...On May 27 vs. BOS served his one game suspension from the incident that took place in Texas on May 15 (bench clearing brawl - hard slide into 2nd base)...From May 20-22 marked the first time to hit a HR in three consecutive games since July 17-21, 2015 & first time to do so in three straight road games since May 13-15, 2011...April 30 at TB hit HR #5 of the season (2R off of Archer)…Marks the 4th consecutive year in which he's finished April with at least five HR...On April 22 vs. OAK had a streak of 30 consecutive games reaching base safely snapped (including post season)...April 9 vs. BOS, smacked his first two home runs of the season, both coming off BOS starter Rick Porcello…Of his 29 career multi-HR contests, 27 of those have been with the Blue Jays - all since the 2010 campaign in which he recorded a club record 54-HR ..Tied for the lead of current Jays with seven Opening Day starting assignments (Edwin Encarnacion)…The only other player in club history with at least seven consecutive opening day starts as a RF was Jesse Barfield (1982-1989, eight seasons). • Finished the season 1st in the AL with 110-BB, 3rd in RBI (114) & T-5th in HR (40)…72 of his 136 hits were XBH (29-2B, 3-3B, 40-HR), 6th in AL. • Walked 110 times, joining Carlos Delgado as the only Blue Jays in club history to reach that mark in four different seasons • Hit his 40th HR of the season September 30 at BAL, joining A. Rodriguez, D. Ortiz, R. Howard and A. Pujols as the only active players with 3+ career 40+ HR seasons…Became just the 2nd Blue Jay in club history to have three 40+ HR seasons (Delgado) and just the 3rd Jay to record 4, 100+ RBI seasons (Delgado-6, Carter-6). • Along with Donaldson (41) and Encarnacion (39) became just the 4th trio in MLB history to hit 39+ home runs in a single season (last: Larry Walker-49, Andres Galarraga-41, Vinny Castilla-40 (COL-1997). • Was named to the AL All-Star team in July, his 6th straight/overall All-Star selection (2010-2015) and his 1st time being chosen by the players…For the 5th straight year was selected as a starter, the only Jay to accomplish that feat…The six All-Star appearances also represent the most by any Blue Jay (Roberto Alomar-5, Joe Carter-5). • Recorded his 5th multi-HR game, 26th as a Blue Jay (28th career) September 26 vs. TB. • Is the 3rd player in club history with 4+ seasons with 30+HR (Delgado-8, Carter-4). • Matched his career high with four walks (3rd time, last: June 20, 2014 at CIN) August 26 at TEX. • Hit his 3rd triple of the season August 22 at LAA, matching his career high single season total (4th time, last 2010). • Hit his 3rd career extra-inning home run August 7 at NYY in the 10th inning off of Pinder (last: July 9, 2011 at CLE). • Collected his 5th career grand slam August vs. MIN hit in the 2nd inning…Marked his first grand slam since Sept. 30, 2010 at MIN. • Slugged his then 224th HR as a Blue Jay to pass Vernon Wells (223) for 2nd on the club's all-time HR list on July 24 at SEA...Became the 3rd Blue Jays player in franchise history to hit 20+ HR in six straight seasons (Delgado, 9x, Carter, 7x). • Led the AL with 66-BB in the first half of the season. • Had his career-high 12-game hitting streak snapped on June 9 vs. MIA (2nd time, last: April 10-25, 2007)…Hit .400 (18- for-45) over those contests. • Matched his single-game career-high marks in doubles (3) and RBI (5) May 26 vs. CWS. • Crushed his 204th home run as a Blue Jay April 12 at BAL to surpass Joe Carter for 3rd on the club's all-time HR list. Reached base safely in 140 of his 154 starts, collecting a careerhigh 158 hits... Hit .345/.449/.629/1.079 in 138 PA vs. LHP...With RISP, hit .309/.444/.574/1.018 in 181 PA...Finished the season ranked 5th in AL (7th in MLB) with a 6.3 WAR (Fangraphs), also ranked 1st in AL (2nd in MLB) with 271 times on base, 4th in the AL (6th in MLB) with an OPS of .928, 2nd in AL (3rd in MLB) with a .403 OBP, 2nd in AL and MLB with 104 walks this season, T-3rd in AL (T-5th in MLB) with 101 runs scored, 5th in the AL (6th in MLB) with 35 home runs, and T-7th in AL (T-9th in MLB) with 103 RBI...Became the 2nd player in club history to post at least 25-2B,35-HR, 100-R, 100-RBI, 100-BB, .400 OBP, and more walks than strikeouts (Carlos Delgado - 2000)… Last player in MLB to accomplish that feat was Albert Pujols with STL in 2010...Is just the 2nd player in franchise history to have three seasons of 35+ home runs (Delgado, 5x)… Is one of five Blue Jays (alltime) to record at least five straight seasons with 20+ HR (Delgado-9, Carter-7, Wells-7, Bell-6)..Was named captain of the AL squad for the 2014 Gillette Home Run Derby...Led the Majors in All-Star balloting (2nd time - 2011) and participated in his 3rd career Home Run Derby and his 5th consecutive MLB All-Star Game (making 4th consecutive starting appearance)...Reached base safely in his 1st 37 games (club record)… It was the longest streak of its kind by a player in the Majors since Albert Pujols in 2008 (1st 41 games)...Was longest on-base streak (at any time) for a Blue Jay since Carlos Delgado reached in 37 consecutive in 2001...Club record for most consecutive games reaching base was 38 set by Delgado in 1998...Recorded 36 multi-hit efforts and 10 three-hit games… The three hits in a game was his season-high, last achieved on Sept. 22 vs. SEA…Had two 4-RBI games (season-high), the last of which was on Sept. 9 vs. CHC… Had two multi-HR games this season...Had his streak of reaching base safely snapped at 28 consecutive games Sept. 26 vs. BAL…Over that stretch had a .320 average, .455 OBP, 11-HR & 26-RBI...Hit his 203rd home run as a Blue Jay on Sept. 22 vs. SEA, tying him with Joe Carter for 3rd on the club's all-time list...Had his career-high tying 13-game hit streak snapped on Sept. 10 vs. CHC…Marked the 2nd such streak this season (last: April 19-May 3)...On August 30 vs. NYY he hit his 100th career home run at Rogers Centre, becoming the 4th player in club history to accomplish the feat (Delgado, Wells & Carter)...Is just the 3rd player in club history to hit 25+ HR in at least five straight seasons (Delgado-9, 1996-2004 & Carter-6, 1991-1996)...Recorded his 2nd multi-HR contest July 25 at NYY (23rd career)… Also finished with a team season-high of 10 total bases in that game (tying Encarnacion, 5/15 vs. CLE)...Walked four times, tying his career-high June 20 at CIN (last: Sept. 16, 2011 vs. NYY)...Recorded his 1,000th career hit on June 18 at NYY...Walked three times Sept. 20 at NYY marking the 18th time in his career he has walked 3+ times (3rd time this season)...April 2 at TB collected 2HR, his 20th multi-HR game as a Blue Jay and the 22nd of his career. Recorded 28 homers becoming the 4th Blue Jay in club history to hit at least 25+ home runs in four consecutive seasons. Currently ranks 6th on the Blue Jays all-time home run list with 168 after passing Lloyd Moseby on May 22 vs. TB. Had a team-high four multi-HR games…Since 2010, has 19 multi-HR games, ranking 1st in the Majors over that time…Now has 21 multi-homer games in his career, with all but two coming as a Blue Jay. Became the first player in Blue Jays history to hit a game-tying home run in the ninth inning and then produce a gameending hit in extra innings on May 22 vs. TB...He finished the game 4-for-4 with two home runs, four RBI and a walk. Was named as the Blue Jays Honda Player of the Month for May by the Toronto Chapter of the BBWAA…He finished the month with a line of .337/.446/.548 (.994 OPS), with seven doubles, five home runs, 16 RBI and 21 runs scored in 28 games. Took part in the All-Star game for the 4th consecutive season…Ranked 3rd in voting among OF at 3,999,631…Started the game for the 3rd straight year in RF and batted 5th (0-1, RBI, K). Was sidelined on August 21 with a left hip injury that would eventually end his season marking the second consecutive year to finish the season on the DL. Despite missing time in both 2012 and 2013, sits 2nd in the majors with 152 home runs since 2010…Miguel Cabrera leads with 156, but has appeared in 100 more games. Played in his 1000th career game May 3 vs. SEA. Was sidelined on July 16 at NYY after damaging a tendon in his left wrist while completing a swing during his AB in the 8th inning...Returned to the lineup Aug. 24, but was removed on Aug. 25 with recurring soreness...Had season ending surgery on Sept. 4...At the time of his injury ranked 2nd in BB (58), T-2nd in HR (27) and T-3rd in RBI (65) in the AL...Earned Honda Player-of-the-Month honours for the club in May and June...Posted a .257 average with nine home runs and 22 RBI in May...Also recorded a team high 20 runs scored along with four doubles and 13 walks...In June batted .271 with 14 home runs and 30 RBI... The 14 home runs set a Blue Jays record for home runs in a single month, surpassing the 12 hit by Carlos Delgado (Aug. 1999), Jose Cruz (Aug., 2001) and Bautista twice (May and Aug., 2010)...Led all Major Leaguers in home runs, (14) RBI (30), walks (22) and slugging (.750) for the month of June...With his 27 home runs now has 140 as a Blue Jay, passing Ed Sprague (113), Kelly Gruber (114), Shawn Green (119), Jose Cruz Jr. (122), Fred McGriff (125) and Ernie Whitt (131) in 2012, and ranks 7th on the Blue Jays all-time list...Homered on Opening Day in the Blue Jays 7-4 16-inning win at CLE on April 5...Was the second consecutive season he has homered on Opening Day...Took part in the All-Star game for the 2nd straight season, 3rd overall (2010-2012)...Ranked 3rd in voting among OF at 4,971,155...Is the 3rd Blue Jay to be voted in as a starter in back to back seasons (Alomar, Carter being the others)...Started in RF, batted 4th (0-1, BB, K)...Represented the AL in the 2012 State Farm Home Run Derby...Lost in the finals to Prince Fielder...Marked the 2nd straight year that he took part in the HR Derby...Had two multi-home run games and now has 17 in his career, with all but two coming as a Blue Jay...Despite missing time in 2012, still leads all Major Leaguers in home runs with 124 since 2010, 12 ahead of Miguel Cabrera. Led the Major Leagues in home runs (43), walks (132), slugging percentage (.608) and OPS (1.056)... RAREAIR: Becomes the first player to lead the Majors in the above categories since Barry Bonds in 2001, and the first AL playersince Ted Williams in 1942... Is the second consecutive season he led the Majors in home runs being the first to do so sinceMark McGwire who did it in four straight seasons from 1996-99... Is just the 5th player in Major League history to record at least40 home runs, 130 walks, and nine stolen bases in a single season... Finished just .0003 points behind for the AL lead behindCabrera in on base percentage... HIT IT FOR HANK: Earned his second consecutive Hank Aaron Award, recongnizing theleague's top hitter... Became just the 3rd player to capture this award in consecutive seasons (Alex Rodriguez, 2001-2003 andBarry Bonds, 2001-2002) and is the 6th recipient to win this award on multiple occasions (Alex Rodriguez-4, Barry Bonds-3,Manny Ramirez-2, Derek Jeter-2 and Albert Pujols-2)... AT IT AGAIN: Was named Player of the Month for both April and May,earning the honour in four of the last five months dating back to last season... Batted .366 in April with nine home runs and 28walks... The 28 walks is a new Club record for that month, surpassing the 26 by Carlos Delgado in 2001... In fact it was the3rd highest total for walks for any month in Club history, two behind the 30 Fred McGriff had in both August & September of1989... In May batted .360 with 11 home runs and 23 RBI... His 11 home runs in May led the AL... It was the 5th straight monthhe led the AL in HR... Last player to do that was Jimmie Foxx (June, 1933 - April, 1934)... Was named Co-Player of the Weekending July 3, batting .391 with three doubles, four home runs and eight RBI... THANKS FOR THE SUPPORT: Received aML record 7,454,753 votes & becomes the 10th Blue Jay to be voted to start the All-Star Game... Started in RF and went 1-2 inthe game... DINGER DAYS: Enjoyed four multi-home run games (15 career), including his first 3-HR game on May 15 at MIN...It marked the 18th time in Club history (14th player) that a Jay has gone deep at least three times in the same game... Was oneof only nine Major Leaguers to hit three home runs in a game this season... Became the 2nd Blue Jay since Carlos Delgado in1999-2000 and first player since David Ortiz in 2004-06 to have consecutive 40+ home run seasons... Set a Blue Jays recordwith 31 home runs at the All-Star break breaking the mark of 29 by George Bell in 1987... July 9 at CLE hit his 100th & 101st HRas a Jay in 379 games, becoming the quickest to 100-HR in Club history (previous best: Fred McGriff in 473 games)... WALKTHIS WAY: His Major League leading 132 walks marks the most since Barry Bonds had 132 in 2007 and is the most by any ALplayer since Jason Giambi had 137 in 2000... Has 232 walks over the past two seasons to rank 1st in the Majors... Led the ALwith 24 intentional walks, two ahead of Miguel Cabrera... TEAM GUY: Started the season in RF, then moved to 3B where hewold make 25 consecutive starts before finishing the season in RF... In total started 115 games in RF and 25 at 3B...NOTABLEPERFORMANCES: Reached base safely in 136 of his 149 games... Had separate streaks of reaching base safely of 23 and24 games... April 1 vs. MIN, tied a Club high for Opening Day with three runs scored... April 22 vs. TB was a single shy of thecycle and set a career high with four runs scored... April 22-24 vs. TB had a stretch of reaching base safely in 11 consecutiveplate appearances... Tied Tony Fernandez (1999) for 2nd on that Club list... Was one shy of the Club record of 12, set by LyleOverbay in May of 2008... Has two separate nine-game hitting streaks... Sept 16 vs. NYY had a career high four walks... Sept22 vs. LAA reached base in five of six plate appearances. Led the majors in home runs (54), extra base hits (92), and T-1st in total bases (351)... Set career highs in most offensive categories including games played (161), runs (109), home runs (54), RBI (124), walks (100) and battingaverage (.260)... In the AL ranked 2nd in walks (100), 3rd in RBI (125), SLG (.617) and OPS (.995)... ELITE COMPANY:Became only the 4th player (5th time) in history to record at least 35-2B, 50-HR, 100-BB in the same season... Is only the16th player in history to hit 54 or more home runs... LIST OF HONOURS: Was named to the Sporting News All-Star Teamas an outfielder, was named a Silver Slugger in the AL as an outfielder and also was selected as the Hank Aaron Awardwinner as the most outstanding offensive performer in the AL... Earned a selection to the All-Star game in Anaheim, going0-1... Was the only player this season to win AL Player of the Month awards twice (July/Aug.) and was the only player to winPlayer of the Week awards three times... Led the AL in home runs in four separate months becoming the first to do so sinceKen Griffey Jr. in 1997... HOMER HAPPY: Set a Blue Jays record with his 54 home runs, surpassing the 47 by George Bellin 1987 (min 300 AB, previous season)... His increase in home runs (41) year-over-year set a new MLB record, passingDavey Jonson who increased his total by 38 in 1973... Led the league in home runs by 15 (Konerko -39), representing the2nd largest gap since 1940 (Mantle-52, Wertz-32 in 1956)... Had nine multi-homer games, five more than anyone else...The nine multi-homer games are tied for the club record with G. Bell (1987)... His 33 home runs at home is the most sinceAlex Rodriguez hit 34 in 2000... Recorded an inside-the-park home run on July 7 vs. MIN... His 124 RBI are the most fora Blue Jay since Delgado had 145 in 2003... FLASH SOME LEATHER: Finished T-2nd in OF assists (12), however didso in only 113 games, leading to a league best 0.11 assists per nine innings... Has now led in assists per nine innings intwo consecutive seasons... Appeared in games in RF (113), 3B (48), 1B (4), and CF (1)... Appeared in seven differentspots in the batting order, beginning the season in the leadoff spot, before settling into the 3rd spot in the order for muchof the season... Batted .278 with 21 home runs in the 7th inning or later, producing one home run for every eight AB's...Recorded home runs in three consecutive games on two occasions... Is one of only 32 Blue Jays to be hit by pitches 10or more times in a season. Appeared in 113 games, at four separate defensive positions, including all three outfield positions...SEPTEMBER TO REMEMBER: Belted eight home runs in the month of Sept. (plus two in Oct.) his highest monthly total ofhis career, tying him for the major league lead...Finished the season with 13 home runs representing the 4th consecutiveseason he has posted double digit home run totals... LONG BALL STREAK: Homered in four consecutive games fromSept. 28-Oct. 2 and hit five over the seasons final seven games... LEND A HAND: Led all Toronto outfielders in assistswith 11, ranking 4th in the AL... He did so in only 70 starts, less than half of those above him on the leaderboard... In facthis 0.15 assists per nine innings was the highest in the majors of any player with 70 or more starts, and represents the 4thhighest mark in Blue Jays history (Bailor 0.21-1980)... Posted two assists on July 25 vs. TB, marking the 1st time a BlueJay outfielder had done so since 2004, and only the 10th time in club history... LIKES THE LEFTIES: Batted .293 vs. LHpitchers, including a .382 on-base percentage and .537 slugging, as opposed to a .202 average vs. RH pitchers... LEAD'EM OFF: Appeared in 17 games as the leadoff hitter, batting .289 with six homeruns and 16 RBI... When leading off aninning, batted .313 with a .400 on-base percentage... Added leadoff home run #4 of his career Sept. 29 at BOS... WORLDBASEBALL CLASSIC: Appeared in three games for the Dominican Republic squad, collecting one hit in three at-bats. Began the season with the Pittsburgh Pirates,batting .242 with 12 home runs & 44 RBI in 107games... TRADING PLACES: Before being traded to theToronto Blue Jays in exchange for C Robinzon Diaz on Aug.21, had been in Pittsburgh's AAA affiliate in Indianapolis(.300, 6-20 in five games)... In 21 games with Toronto, batted.214 with three home runs & 10 RBI... Has now hit atleast 15 home runs in each of his last three seasons (46 total)...CAREER MARKS: Had his 2nd career multi-HRgame occur on May 2 atWAS& recorded a season high fourRBI in that contest... Hit a home run & drove in three runs onthe following day vs. the Nationals... Established a careerhigh with four hits on May 31 at STL... STREAKING: Had 10hits over a 16 at bat span from May 30-June 2...Homered inthree of four games from June 14-18 (three total) & five ofnine games from June 14-24 (five total)... Appeared in hisfirst game with Toronto on Aug. 22 vs. BOS as a pinch-hitter...Snapped a career high 27 at bat hitless streak (July30-Aug. 30) with a RBI single off Brian Bruney in the 7th inning...That single represented his first run driven in as aJay... Matched his career high with a four hit game on Sept.2 vs. MIN, hitting his 1st HR as a Blue Jay in that contest (2Roff Perkins)... IN THE FIELD: Appeared in 93 games atthird, four games at first, two at second & seven as theDH...Made 11 errors in 268 total chances combined betweenPittsburgh & Toronto this season for a fielding % of .959...Made his first career start as a first baseman on Aug. 31 atNYY. Established career highs in nearly every offensive category; fell one homer shy of career-high of 16 hitin 2006...Made 122 starts at third base, 13 in right field, four in center field and one in left field...Ranked fifth among N.L. thirdbasemen with a .958 fielding pct. (minimum: 120 games); made total of 15 errors (nine fielding/six throwing)...Hit .324 (22-for-68)in 19 games from the seventh spot of the batting order...Batted .289 (33-for-114) with 15 walks and 22 runs scored in 28 gamesas the leadoff hitter...Made first Opening Day start and went 2-for-4 with a double on 4/2 at Houston...Batted .308 (16-for-52) withfive doubles during career-high 12 game hitting streak from 4/10-25...Led club with a .293 batting average during the month ofApril...Started each of the first 36 games at third base; sprained left ankle on 5/13 vs. Atlanta and did not start next four games...Didnot commit an error in his first 34 games (122 total chances) before making first miscue on 5/12 vs. Atlanta...Knocked in two ofhis five runs in May on 5/3...Flied out while making lone pinch hitting appearance on 5/16 vs. Florida...Batted leadoff for the firstof 28 times on 5/22...Hit safely in 12 of his 13 games from 5/20 thru 6/2, going 19-for-53 and raising average from .254 to .283....Hit first of two leadoff home runs on 6/12 vs. Texas...Fell a home run shy of hitting for the cycle on 6/13 vs. Texas...Hit secondleadoff homer on 6/17 vs. Chicago (AL)...Suffered a lacerated left hand while sliding into third base at Atlanta on 7/14; his handhit Chipper Jones' spikes...Was placed on 15-day disabled list on 7/15...Had stitches removed from hand on 7/25...Began a two-gamerehab assignment with GCL Pirates on 7/30...Was reinstated from the D.L. on 8/1 and went 2-for-5 with a pair of RBI and a runscored with Pittsburgh that night vs. St. Louis...Made first of 13 starts in right field on 8/4 (made each of his first 88 starts at thirdbase)...Made first of four starts in center field on 8/9 at Arizona...Made lone appearance (start) in left field on 8/13 vs. San Francisco(game one)...Had first career two-homer game on 8/25 at Houston...Homered six times in final 19 games in August; hit a total ofseven in first 96 games prior to 8/13...Picked up lone outfield assist while playing right field on 8/26 at Houston...Homered twicein September, hitting last one on 9/14 at Houston...Ranked third on club in doubles...Hit 11 of his 15 home runs off righthanders....Participated in the Dominican Winter League and batted .258 (8-for-31) with two homers and eight RBI in nine games with Licey. Began season with Triple-A Indianapolis...Made 23 appearances at third base, four in center field and one apiece at second base, left field and designated hitter...Homered for the first time on 4/23 at Louisville...Went 3-for-4 with a home run and three runs scored on 4/30 vs. Columbus...Went 16-for-46 (.304) in final 13 games with Indianapolis...Was recalled by Pittsburgh on 5/7 after Joe Randa was placed on the disabled list...Started that afternoon in right field and went 2-for-4 with a triple and an RBI while batting leadoff...Hit safely in six of his first seven games upon promotion and reached base safely in each of his first nine contests. ...Scored a run in seven consecutive games from 5/10-18 (nine runs total)...Took Florida's Scott Olsen deep for first career home run on 5/13...Also homered vs. Florida on 5/14...Made seven consecutive starts at third base from 5/9-17...Made first of 46 starts in center field on 5/18...Was placed on the bereavement list from 5/20-24 (grandmother passed away)...Ended a 5:49 contest on 5/27 vs. Houston with a walkoff sacrifice fly in the bottom of the 18th inning...Had first career three-hit game on 5/29 vs. Milwaukee...Went deep in back-to-back games on 5/28-29...Took San Francisco's Tim Worrell deep for first career grand slam on 6/11 at AT&T Park. ...Homered three times in a five-game span from 6/10-15...Hit first career leadoff home run on 6/15 off St. Louis' Mark Mulder at PNC Park...Hit safely in nine consecutive games from 6/27-7/5 (16-for-37, .434) and in 15 of his 16 games from 6/27-16...Tallied an RBI in six straight games from 6/28-7/3 (seven total)...Led club with six home runs in June...Had two outfield assists on 7/23 at Florida...Reached base safely in 21 of his 23 starts during the month of July, batting .309 with a .375 on-base percentage...Made first of five starts in left field on 8/14 vs. Milwaukee...Had two outfield assists in 8/19 contest at Cincinnati...Made first career appearance at second base on 8/27 vs. Houston...Was walked with the bases loaded to force home winning run in 11th inning on 8/29 vs. Chicago...Made first career start at second base on 9/15 vs. New York; made second start there on 9/17 vs. New York...Connected off Elmer Dessens for second grand slam on 9/19 at Los Angeles - also tallied career-high five RBI?in the game...Homered in back-to-back games for the fourth time on 9/19-20...Made total of 46 starts in center field, 31 at third base, 16 in right field, five in left field and two at second base for the Pirates...Made 44 appearances in the leadoff spot and hit .266 (49-for-184) with eight homers, 19 RBI, 21 walks and 32 runs (.360 on-base pct. )...Participated in the Dominican Winter League and batted .285 (41-for-144) with four homers and 21 RBI in 45 games with Licey. Hit .280 with 30 doubles, 24 home runs and 94 RBI in 130 minor league games between Altoona (AA) and Indianapolis (AAA) and was named Pittsburgh's Minor League Player-of-the-Year...Led all farmhands in RBI and ranked third in home runs behind Brad Eldred (28) and Josh Bonifay (25)...Spent majority of the season at the Double-A level...Had batting average of .324 (11-for-34) after his first eight games...Produced eight-game hitting streak from 4/27 thru 5/5, batting .448 (13-for-29) with four doubles, two home runs and five RBI...Went deep for the first time on 4/29 vs. Trenton...Had four hits and three RBI on 5/18 @Bowie...Hit safely in 30 of his 37 contests from 6/7 thru 7/19, going 46-for-144 (.319) during the stretch...Knocked in 70 runs from 6/12 thru 8/22...Hit .327 (37-for-113) with seven doubles, one triple, seven home runs and 33 RBI in 28 games during the month of June...Homered in three straight games from 7/8-15...Was selected to play in the Futures Game on 7/10 at Comerica Park in Detroit (walked and singled in his two plate appearances for the World Team)...Was also named to the Eastern League mid-season All-Star team...Collected 12 RBI over a nine game stretch from 8/1-9...Hit .319 (15-for-47) in final 12 games with Altoona and had seven RBI in final three games with the Curve...Finished third in the Eastern League in RBI...Was named to the Eastern League post-season team...Was promoted to Triple-A on 8/23...Made debut with Indians on 8/24 vs. Richmond and went 2-for-5 with a double...Hit safely in four of his first five games with Indianapolis before going hitless in 13 at bats from 8/28-31...Produced back-to-back three-hit games on 9/1 and 9/2...Hit first Triple-A homer in final game of regular season on 9/5 vs. Toledo...Went 7-for-24 (.292) with two doubles, a home run and four RBI in eight postseason games with Indians...Was recalled by Pittsburgh on 9/16. ...Started both games of a doubleheader that night vs. Cincinnati and went a combined 2-for-7 with a run scored...Swiped first major league base on 9/26 @Los Angeles...Picked up only extra base hit (double) in the final game of the season on 10/2 vs. Milwaukee...Hit safely in four of his seven starts at third base...Also went 0-for-2 with a walk as a pinch hitter...Went 3-for-13 in first four games with Pirates, but 1-for-15 in last seven...Committed one throwing error...Participated in the Dominican Winter League and batted .260 (34-for-131) with eight homers and 26 RBI in 44 games with Licey. Hit .205 with three doubles and two RBI in 64 major league games with four different teams...Began season with Baltimore after being selected off Pittsburgh's Triple-A roster in Rule Five draft on 12/15/03...Made major league debut on 4/4 vs. Boston as a pinch runner and scored first big-league run...Singled off Boston's Ramiro Mendoza as a pinch hitter in first major league plate appearance on 4/7 @Camden Yards...Entered the game as a defensive replacement @third base on 4/10 @Tampa Bay...Made first big-league start in right field on 4/20 vs. Tampa Bay...Finished April with a .286 (2-for-7) average...Made second and final start with Baltimore in right field on 5/15 vs. Anaheim...Was designated for assignment on 5/25 and was claimed off waivers by Tampa Bay on 6/3...Made Devil Rays debut on 6/4 @Baltimore as a pinch runner...Started in left field for first time on 6/10 vs. San Francisco...Made final appearance with Tampa Bay on 6/24 @Toronto; started in left field and also collected first major league RBI...Was designated for assignment on 6/25...Was acquired by Kansas City on 6/28 for cash considerations...Made debut with Royals on 6/30 vs. Baltimore as a defensive replacement @third base...Made four straight starts @third base from 7/1-6...Went 2-for-5 with a double on 7/22 @Detroit...Struck out 12 times in 25 at bats during the month of July as a member of the Royals...Was acquired by New York (NL) on 7/30 in exchange for minor league catcher Justin Huber; was then acquired by Pittsburgh later in the day...Struck out as a pinch hitter while making debut with Pirates on 7/31 @Milwaukee...Made first start with Pittsburgh in right field on 8/7 @San Diego and went 2-for-3 with a double...Hit safely in three straight games from 8/15-18, raising average to .375 in first 10 games with Pittsburgh...Committed two errors (one fielding, one throwing) in first career start in center field on 9/4 @Houston...Went hitless in last 21 at bats...Went 2-for-10 as a pinch hitter with Pittsburgh...Made a total of 19 appearances (10 starts) in right field, five appearances (three starts) in left field and three appearances (one start) in center field during entire season...Played for Licey in the Dominican Winter League and hit .224 (11-for-49) with two home runs and five RBI in 13 games. Was limited to 51 games with Lynchburg (Pirates' A)...Made 44 appearances @third base and seven appearances @second base with the Hillcats...Hit .417 (15-for-36) in his first 12 games...Went 8-for-11 with four doubles, a home run and six RBI in first three games...Was placed on the disabled list on 5/24 after suffering a broken right hand...Hit .348 (8-for-23) in seven rehab games 8/7-19 with Bradenton...Returned to Lynchburg on 8/20 @Frederick...Had one hit in final four games of regular season...Batted .375 (6-for-16) with a home run and an RBI in Carolina League playoffs...Was selected by Baltimore in the Rule Five Draft on 12/15...Played for Licey in the Dominican Winter League and hit .265 (30-for-113) with two home runs and nine RBI in 42 games. Spent entire season with Hickory (Pirates' A)...Made 124 appearances @third base, two @shortstop and three as the designated hitter...Ranked 10th in the South Atlantic League in batting...Was selected to the South Atlantic League mid-season All-Star team...Tied for eighth among Pirate farmhands in extra base hits (43)...Finished 10th in organization in homers and fourth in on-base percentage (.402)...Collected an RBI in five straight games (seven total) from 4/22-26...Reached base safely in 19 consecutive games from 6/4 thru 6/27...Batted .382 (34-for-89) in July and .322 (29-for-90) in August...Hit .368 (14-for-38) in final 11 games. Spent first professional season with Williamsport (Pirates' A)...Finished third on the team in home runs and tied for fourth in RBI...Played 59 games @third base and three games in the outfield...Reached base safely in first 12 games...Batted .333 (11-for-33) during nine-game hitting streak from 7/12-20...Hit first professional home run and had season-high four RBI on 7/3 vs. New Jersey...Hit .413 (19-for-46) from 8/15 thru remainder of the season. October 29, 2018 RF Jose Bautista elected free agency. August 28, 2018 New York Mets traded RF Jose Bautista to Philadelphia Phillies for Player To Be Named Later. May 22, 2018 New York Mets signed free agent RF Jose Bautista. May 20, 2018 Atlanta Braves released 3B Jose Bautista. May 4, 2018 Atlanta Braves selected the contract of 3B Jose Bautista from Gwinnett Stripers. April 23, 2018 3B Jose Bautista assigned to Gwinnett Stripers from Florida Fire Frogs. April 18, 2018 Atlanta Braves signed free agent OF Jose Bautista to a minor league contract. November 4, 2017 RF Jose Bautista elected free agency. January 18, 2017 Toronto Blue Jays signed free agent RF Jose Bautista. November 3, 2016 RF Jose Bautista elected free agency. August 25, 2016 Toronto Blue Jays activated RF Jose Bautista from the 15-day disabled list. August 10, 2016 Toronto Blue Jays placed RF Jose Bautista on the 15-day disabled list. Left knee sprain. July 25, 2016 Toronto Blue Jays activated RF Jose Bautista from the 15-day disabled list. July 22, 2016 Toronto Blue Jays sent RF Jose Bautista on a rehab assignment to Buffalo Bisons. July 20, 2016 Toronto Blue Jays sent RF Jose Bautista on a rehab assignment to Dunedin Blue Jays. May 28, 2016 Toronto Blue Jays activated RF Jose Bautista. May 27, 2016 RF Jose Bautista roster status changed by Toronto Blue Jays. October 1, 2013 Toronto Blue Jays activated RF Jose Bautista from the 15-day disabled list. August 21, 2013 Toronto Blue Jays placed RF Jose Bautista on the 15-day disabled list. Left hip bone bruise. October 4, 2012 Toronto Blue Jays activated RF Jose Bautista from the 15-day disabled list. August 26, 2012 Toronto Blue Jays placed RF Jose Bautista on the 15-day disabled list. Left wrist injury. August 24, 2012 Toronto Blue Jays activated RF Jose Bautista from the 15-day disabled list. August 23, 2012 sent 3B Jose Bautista on a rehab assignment to New Hampshire Fisher Cats. August 21, 2012 GCL Blue Jays sent OF Jose Bautista on a rehab assignment to Dunedin Blue Jays. August 20, 2012 OF Jose Bautista assigned to GCL Blue Jays. October 16, 2009 OF Jose Bautista assigned to Tigres del Licey. May 7, 2006 3B Jose Bautista assigned to Pittsburgh Pirates. March 29, 2006 3B Jose Bautista assigned to Pittsburgh Pirates. March 29, 2006 3B Jose Bautista assigned to Indianapolis Indians. September 16, 2005 3B Jose Bautista assigned to Pittsburgh Pirates. 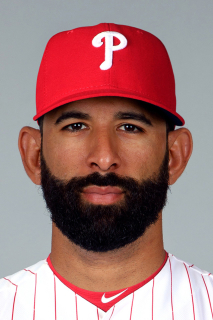 March 20, 2005 3B Jose Bautista assigned to Pittsburgh Pirates.